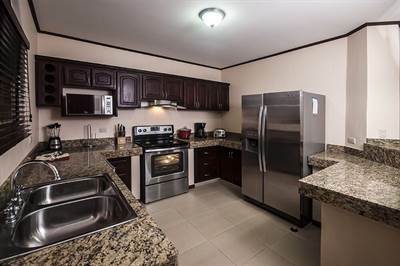 New listing, located between Herradura and Jaco Costa Rica, one of the best condo values in the area. This is a spacious 3 bedroom/3 bath fully furnished top floor unit, with private roof top terrace. 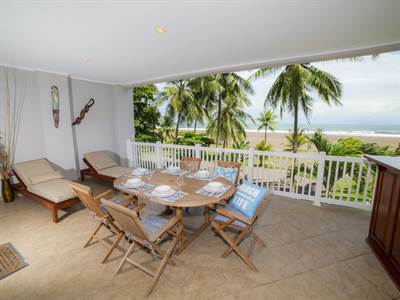 It’s located just steps away from wonderful, expansive swimming pool area and gardens, and is an easy drive to all amenities and beaches in the Jaco area. Condo complex is totally secure with 24 hour security and located right off the Pacific Coast two lane highway, minutes from the Marina and Golf Course at Los Sueños Resort, the bustling beach city of Jaco, and an easy one hour drive to the capital city of San Jose and the international airport. This development backs up to thousands of acres of gorgeous jungle covered hills adding to the “Garden of Eden” feel (see Google map). This top floor unit is in excellent condition, has a fantastic rental history and is especially attractive for those seeking a luxury condo with ample outdoor patio areas. This area has a year- round sunny tropical climate, ideal for enjoying the warmth and natural beauty of the area. The swimming pools, garden and rancho areas are quiet and well kept, and you’ll love the fact that the monthly condo fee is only $279 a month, which makes this the lowest HOA fee in the area. This exclusive new listing is located directly on the beach at The Palms, a premium beachfront development at Jaco Costa Rica’s beautiful North Beach. 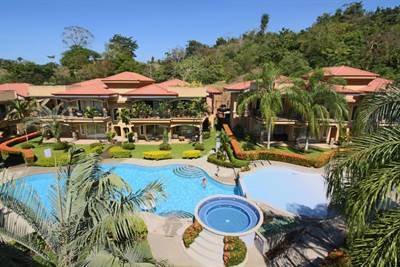 This is a 2 bedroom/2 bath condo, 2nd floor unit, with huge balconies, sliding glass doors and large windows to accent breathtaking views of the Pacific Ocean, jungle covered hills, and the expanse of the Bay of Jaco. Sold fully furnished with property management in place (if needed). OWNER FINANCING AVAILABLE. 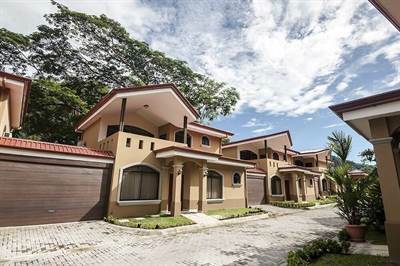 4 Bedroom Townhome, Almost Beachfront, LOW HOA, Beautiful Area in Puntarenas, Jaco is Sold! in Puntarenas, Jaco The 2 storey at 4 Bedroom Townhome, Almost Beachfront, LOW HOA, Beautiful Area has been sold. Posted on November 6, 2018 Author Jaco Area PropertiesLeave a comment on 4 Bedroom Townhome, Almost Beachfront, LOW HOA, Beautiful Area in Puntarenas, Jaco is Sold! FIRESALE! 4 bdrm, only 20 YARDS via private trail TO THE BEST PART OF THE BEACH IN JACO in Jaco, Jaco is Sold! in Jaco, Jaco The 2 story at FIRESALE! 4 bdrm, only 20 YARDS via private trail TO THE BEST PART OF THE BEACH IN JACO has been sold. Posted on November 6, 2018 Author Jaco Area PropertiesLeave a comment on FIRESALE! 4 bdrm, only 20 YARDS via private trail TO THE BEST PART OF THE BEACH IN JACO in Jaco, Jaco is Sold!